Forgive the awful picture.....taken with my camera phone. But just wanted to show a quick project I did for Valentine's. I had a bit too much organza sitting around that wasn't being used and decided to cut some hearts out with pinking shears. 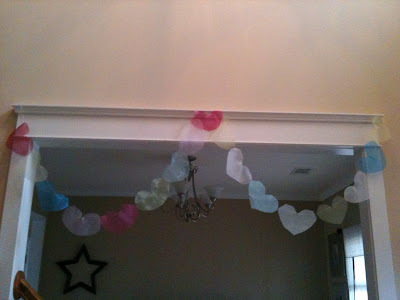 I just ran them through the sewing machine one heart after another, in one long chain to make a sort of garland. I know a lot of people use paper or cotton or felt to make Valentine's garland, but I kinda like the sheerness of the organza. Makes it a bit whimsical.